Bake ................ To cook foods in the oven. Baste ............... To brush or pour water, melted fat or other liquid over food. Beat ................ To make a mixture smooth or to introduce air by using a brisk regular motion that lifts the mixture over and over. Beat Lightly .... To beat lightly with a fork to mix. This process usually applies to just mixing the whites or the yolks of eggs. Bind ................ To hold foods together with a sauce. Blanch ............ To parboil in water for a minute, or to pour boiling water over food and then drain it almost immediately. Blend .............. To thoroughly mix two or more ingredients. Boil ................. To cook in boiling water. Bread .............. To roll in crumbs. Often the food is dipped first into beaten egg and then rolled in the crumbs. Brush .............. To brush food with melter fat or liquid to coat it. Chop ............... To cut into pieces with a sharp knife. Cream ............. To work one or more foods unti mixture is soft and creamy or fluffy. Cube ............... To cut into small equal squares. Dice ................ To cut into cubes. Disjoint ........... To cut poultry into pieces at the joints. Dissolve .......... To completely mix dry ingredients with liquid until in solution. Dot ................. To scatter small pieces of butter or other fat over food before cooking. Dust ................ To sprinkle food lightly with a dry ingredient such as paprika. Fillet ............... To cut a piece of meat or fish into desired shape, removing all bones. Flake ............... To break into small pieces with a fork. Fold ................ To combine by using two motions, cutting vertically through the mixture and turning it over and over by sliding the implement across the bottom of the mixing bowl with each turn. Garnish ........... To decorate foods, usually with other foods. Grate ............... To cut food into minute particles by rubbing on a grater. Grind ............... To cut food into tiny particles by running through a grinder. Julienne .......... To cut foods into match-thin strips. Knead ............. To fold, turn, and press down on dough with the hands until it becomes smooth and elastic. Mince .............. To cut or chop intovery small pieces. 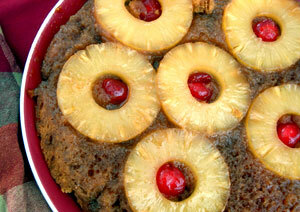 Mix .................. To combine ingredients in any way that evenly distributes them. Parboil ............ To partially cook food in boiling water before completely cooking in another way. Pare ................ To cut off the outside covering. Peel ................. To strip off the outside covering. Scald ............... To heat milk to just below the boiling point. Scallop ............ To bake food in layers with a sauce. Shred ............... To cut finely with a knife or sharp instrument. Sift ................... To put dry ingredients through a sifter or sieve. Sliver ............... To slice into long, thin strips. Stew ................ To cook long and slow in a liquid. Stir .................. To mix foods with acircular motion for the purpose of blending or securing uniform consistency. Tear ................ To break or tear into bite-size pieces. Whip ............... To beat rapidly to produce expansion due to the incorporation of air as applied to cream, egg and gelatin dishes. We've just kind of been going along with schoolwork for this year, with the ever-present nagging thought that we aren't quite getting enough done. Does ANY homeschooler ever feel like they are doing enough? So there have been those thoughts running through my head, along with the knowledge that I really don't spend enough time with each of the children - individually helping and supporting them in their schoolwork. Thank the LORD for friends! It is always wonderful to talk to someone else, see what someone else is doing, or just watch for a while. The things you pick up may surprise you. To detour here for a minute - I found this same situation to be true for cooking recently. I had the opportunity to visit with an uncle and aunt and my father and step-mother a few weeks ago. It is so interesting to watch someone else cook, isn't it? Well, my aunt and I got to talking about dumplings, I shared how I've made them but hadn't had success with them lately. So she gave me her recipe which is her mother's never-fail-the children-love-them. She even called me after Thanksgiving to see if I had made them with my turkey leftovers. ;-) Watching my step-mother cook was even more informative. She didn't do anything fancy, it was just a few little ways she did things. Like how her corn - in the frozen bag, just like I get - tasted JUST like corn on the cob! What did she do? She added plenty of butter as well as some salt and pepper. See? Not fancy but I had never thought of adding anything but butter. Then one night she cooked her meat in a certain way - seared it on both sides, added some broth, and covered the skillet to finish cooking. Then she made a gravy from the juices in the pan. Simple but really good. So this past week, it was approaching dinner and there was a chuck roast in the refrigerator. I really didn't have time for it to sit in the oven slowly roasting and then I remembered -- why not cook it in the pan? So I seared the meat, added plenty of onions and garlic and covered it. I even cut up a head of cabbage and added that on top, too. It was like a roast in a skillet. Then when it was done I made a gravy from the juices to go on our potatoes. So - we're at the dinner table - dinner is almost over - and DH said "That was good. You can make that again." WOW! I don't want to say that he's a picky eater, but it isn't often that I hear those words. Visiting has its' rewards! DS2 has chosen a Beautiful Feet History Guide (link to Beautiful Feet is in my right-hand column under "Homeschool Stuff") which will give him plenty of reading material as well as the opportunity to be on his own, study-wise, with support from me as needed. I have committed to assisting DS3 with his Lone Scouting and checking regularly with him to see what he currently needs as far as help and guidance are concerned. Now I have three pleased and focused children and the lure of new books and new adventures in learning. And all of this heading into December - usually a no-man's-land of deserted school books and empty spaces on our school-year calendar. Oh - we went to the library yesterday to get the needed books for Prairie Primer, and as I was going over the list, searching the shelves, gathering books, and watching my pile grow higher and higher there was just a little joy in my heart. Then I remembered why I love homeschooling so much and that I am a Unit-Study Mom at heart!! This school year is the first time I've ever used any Sonlight Curriculum - I purchased Intro to World Cultures and Science for level K. We've really enjoyed it and the reading has been just what I wanted - something just for daughter and I to snuggle up with, me reading to her and she reading to me, as well as talking and sharing and doing really fun stuff like . . . .
Today daughter and I had great fun (her brothers watched eagerly from the sidelines) testing for the presence of acids in various items. 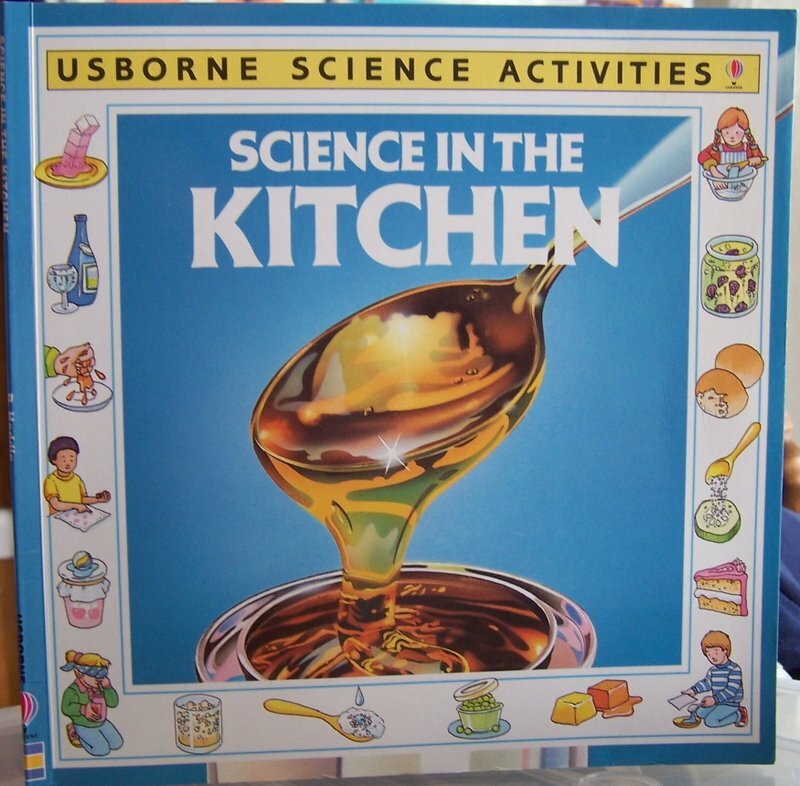 One of the books that we've been using is Usborne Science in the Kitchen, which is what guided us today. We started out by cutting up some red cabbage and boiling it in a saucepan full of water. After it cooled (while we were gone for piano lessons ;-) , then we strained it, poured it into several plastic cups and added various liquids to see if they were acids or not. If the cabbage water stays the same deep blue color, then there is no acid present. Any color change, especially to red or purple, indicates the presence of an acid. It was Very Cool watching the colors change before our eyes, and to see the different shades indicating more or less acids. The milk hardly changed at all, the salt and sugar stayed just the same. The lemon juice was the most extreme reaction, along with the vinegars. The yogurt was interesting - I didn't think it would change that much, and the cola changed slightly to a deep muave-ish-purple. 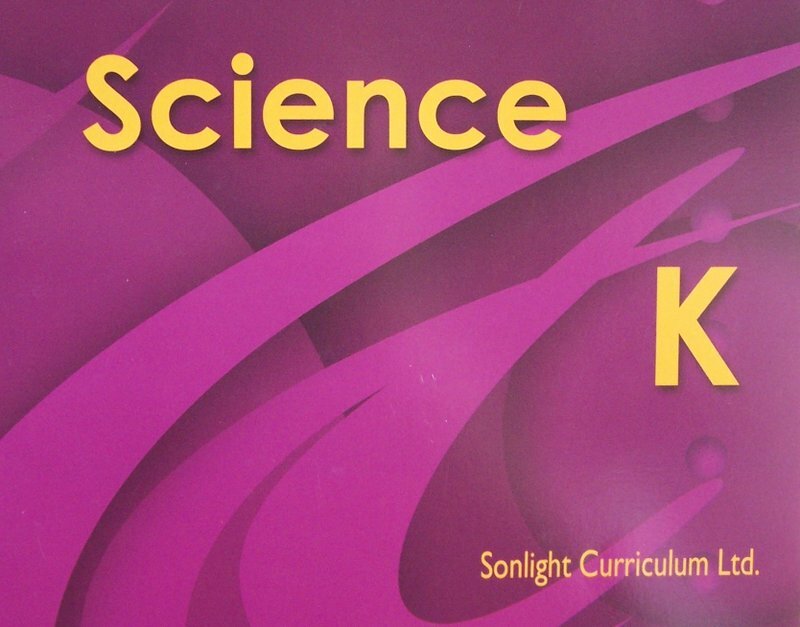 We are enjoying science so much that we may just do Sonlight Science next year, too. The best part of it is watching the great Discover & Do DVD that is made just for Sonlight (in John & Sarita's kitchen, no less!!) Each DVD segment demonstrates the little lessons being taught in the Usborne Science books (Science in the Kitchen, Science with Plants, and Science with Air). Sometimes we just put the DVD in and we all watch it just for fun! I found a very interesting site last night that I am very much looking forward to trying! It is called The Prepared Pantry. They sell baking mixes and such to make your time in the kitchen as productive as possible. But that is not why I'm mentioning it. The VERY cool part is that it has a bunch of FREE STUFF! All of the FREE items are in the form of either a downloadable/printable booklet or weekly e-mail lessons. Let's start with Ingredients and How They Work. Then we can move onto a Free Baking Book. Would you like an Eight Week Course in Baking? All About Pies, Everything You Need To Know About Chocolate Chip Cookies, or The Perfect Easter Dinner? They also have all kinds of help for moms, including recipes and ideas for treats and kitchen fun your children will love! Along with loads of Breakfast Ideas and information about Food Storage. On top of all this, you can subscribe to their weekly newsletter, Bake It Better! I'll be expecting plenty of Baking going on this month!! Wait! I forgot to mention that they also have a recipe collection for Chicken Soup! 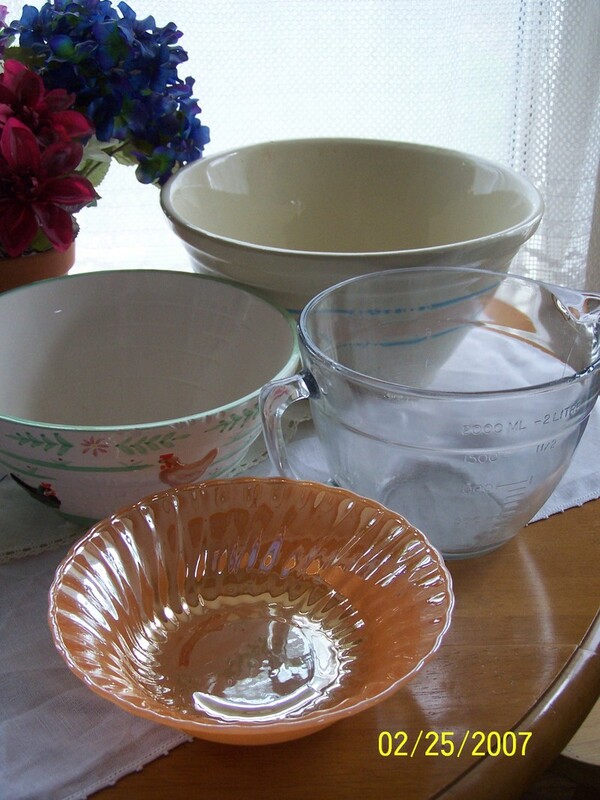 I never really thought much about bowls until I read an excellent posting a few years ago by Lady Lydia at LAF titled "The Mixing Bowl." If you have not read it, I would highly encourage you to do so. I love the picture she paints of the woman of the house standing with her apron on, holding the mixing bowl firmly with one hand and arm, stirring vigorously with her other, all the while watching over the affairs and doings of her home. There is such grace and nostalgia in a simple apron, a mixing bowl and a wooden spoon. A gentleness that pulling the mixer out of the cupboard will never be able to match. I have my own favorite bowls now, each with it's own story and purpose. This is my Grandmother's bowl. 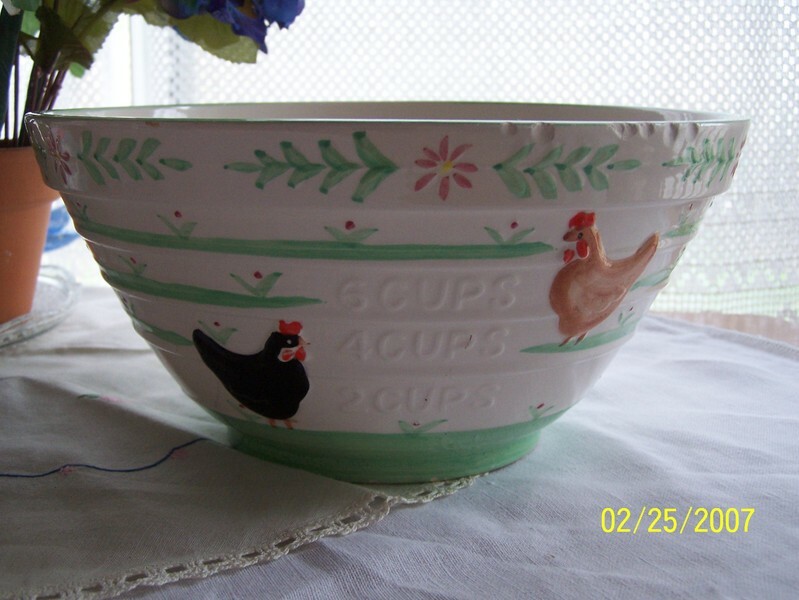 This is also my largest bowl which is used for the BIG things like making bread, holding a family-size serving of noodles, or for mixing up a big batch of Refrigerator Bran Muffins which will last us for a week of breakfasts. It is a heavy ceramic bowl and I love using it because it brings back thoughts of a Grandmother whom I never really got to know, yet wish I had. Bittersweet - I understand what that means now. 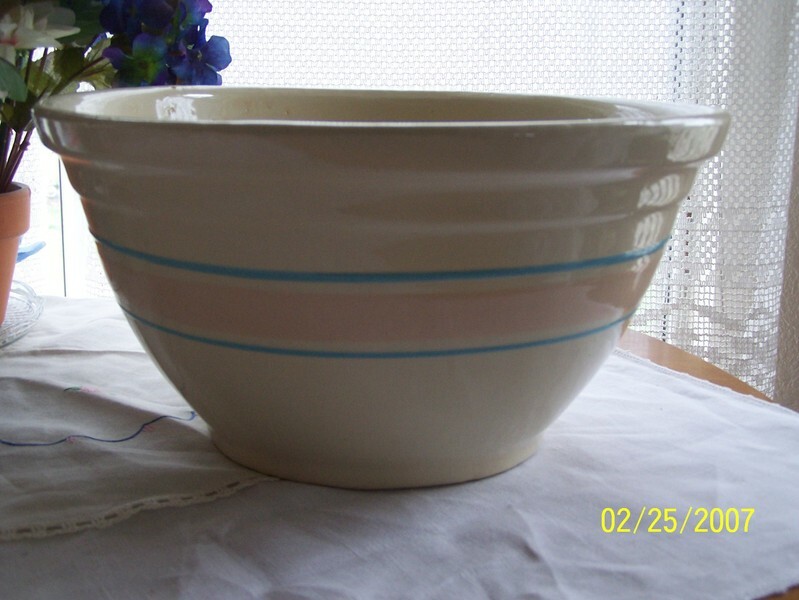 This one is a two-quart batter bowl that I bought several years ago from Pampered Chef. This is invaluable to me for a quick batch of muffins or pancakes in the morning or for brownies in the evening . It's even been known to handle some tuna salad for lunch! It also has a lid and is great for storing leftover soups. 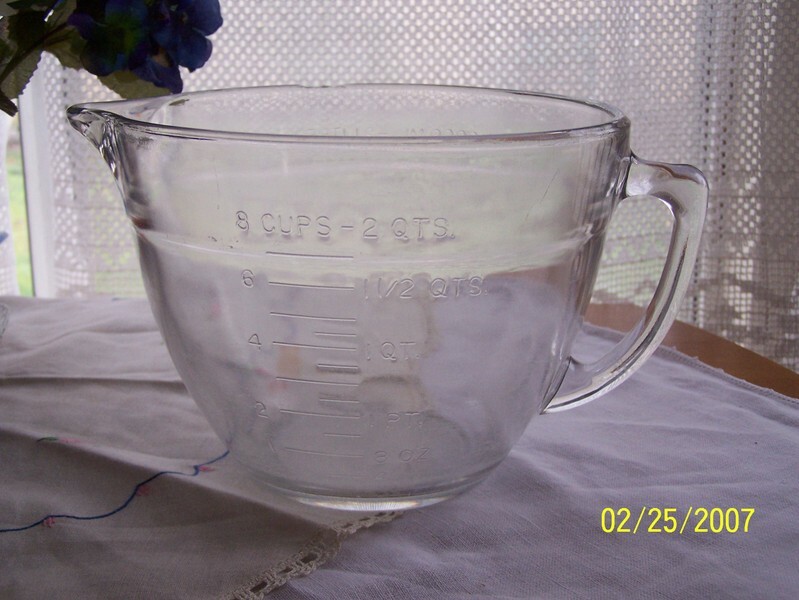 I couldn't be without this or his little sister, the one-quart batter bowl. 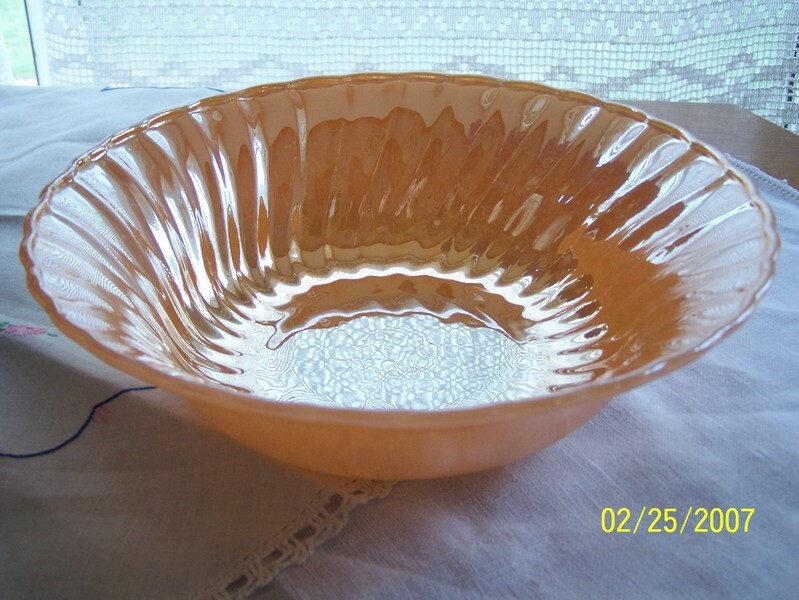 This little bowl is not for mixing - it is simply pretty and I love serving things in it on the table. It has held chips, scrambled eggs, salads, and vegetables. I didn't buy this bowl, it was actually left at the house we bought. It was left in the garage, underneath some shelves with planting containers. I guess at one time it held a potted plant and was then forgotten. But it caught my eye as soon as I saw it. I took it in the house and scrubbed it clean. Now it is a little bright spot in my cupboard or on the table! This cheery bowl was found on the bottom shelf at Goodwill. I love all things chicken and so this immediately caught my eye! It is a bit chipped around the top, but it is useful just the same. This is the bowl that sits out on my stovetop - not only decorative but practical, too. Whenever I am cooking and need a quick place to put something, this is the bowl. It holds cooked onions for me while I finish cooking the meat, and it keeps the fajitas or taco meat warm while I heat the tortillas in the skillet. This is my little everything bowl and I'm so glad I found it! What memories in the making are in your kitchen? What are your everyday treasures that will last forever in the minds of your children? I hope you have a few, or if not that you'll get some soon.